Admissions Open at Dow University of Health Sciences's Karachi Campus for the batch Fall 2018. DUHS offers admissions in different fields of study for Masters. you can apply for , MS - Master of Science, . 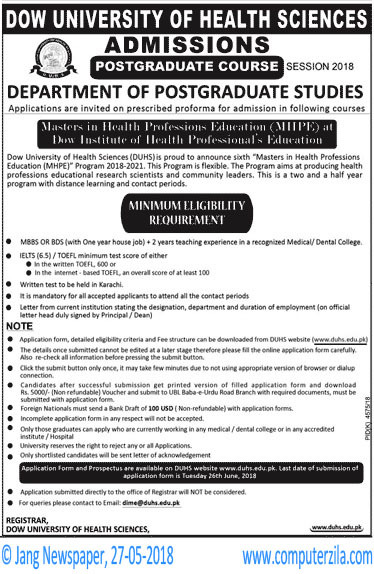 Dow University of Health Sciences (DUHS) is proud to announce sixth "Masters in Health Professions Education (MHPE)" Program 2018-2021. This Program is Flexible. The Program aims at producing health profession educational research scientists and community Leaders. this is two and half year program with distance learning and contact periods. MBBS opr BDS (with one year House JOB) + 2 years teaching experience in a recognized Medical/Dental College.